Harmonix has detailed what's ahead for Rock Band 4 in the coming months, including online multiplayer and an expansion. At PAX East this weekend, Harmonix announced some of the content coming to Rock Band 4 this fall. First up (in May) will be some free bandmates, specifically Miko and Thorn from Gearbox's Battleborn. They're also adding double kick support. In June, they'll be adding a Practice Mode that will let you play through songs and slow down difficult portions to help you finally get them down pat. Later this fall, Harmonix plans to release an expansion as well. Although the full details of what's included won't be announced until E3, Harmonix did reveal a few things. It will add support for the Xbox 360 ION Drum kit, although it will require the purchase of a new adapter from PDP. It will also add new filtering and rating tools to the music library. Finally, around the holiday season, we should the addition of synchronous online multiplayer. In a post on the [a href="http://blog.us.playstation.com/2016/04/24/rock-band-4-online-multiplayer-coming-this-year/" target="_blank"]PlayStation Blog[/i], Harmonix described the upcoming mode, saying, "Synchronous online multiplayer will be like Quickplay, modified to provide a fair and streamlined experience for console friends looking to play Rock Band 4 together online." 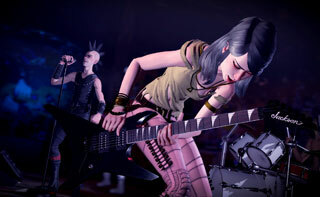 Like the expansion, Harmonix promises more multiplayer details at E3. When Rock Band 4 launched, Harmonix said they wanted to make it more of a platform than a game, and these additions will definitely contribute to that goal.